Agricultural Journalism (left) and Agricultural Engineering Buildings on the west side of Henry Mall. The Agricultural Journalism building originally housed Agronomy. Postmark 1914. Image courtesy UW Digital Collections. The Department of Biological Systems Engineering has its roots in the foundations of the College of Agriculture and Life Sciences. The College was founded as the College of Agriculture in 1889. Dean William A. Henry and Agricultural Physics Chair Franklin H. King were influential in the beginnings of the College. Henry founded many institutions that are still familiar today, such as Short Courses and Cooperative Extension programs. King made important advancements in barn ventilation, draft of plows, and silo design. As interest in further combining agriculture and engineering grew, university leaders were petitioned to create a department for the purpose. BSE was founded as the Department of Agricultural Engineering in 1904, with George N. Knapp as the Chair. Construction began on a building for the department next to the newly finished Agricultural Hall. 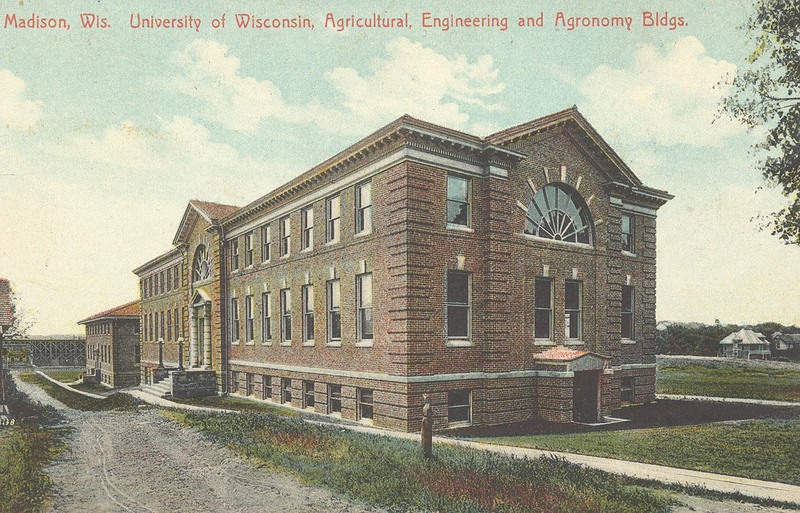 The Agricultural Engineering Building was completed in 1907, designed by Arthur Peabody with its distinctive fanlights on the east, north, and south faces. On December 27th of that year, 18 members of the field gathered in the building to found the American Society of Agricultural Engineers (ASAE, now ASABE). Charles A. Ocock replaced Knapp as Chair in 1907, and held that position until 1913, also serving as the President of the American Society of Agricultural Engineers (ASAE, now ASABE) in 1911. Frank M. White became the Department Chair in 1913, and also served as ASAE President in 1916. Edward R. Jones became the Chair in 1918. Under his guidance, the department continued to grow and continued to innovate in agriculture and conservation. Edward Jones kept this position until his death in 1937 at the age of 54. The Memorial Panel above 125 Agricultural Engineering, painted by CALS artist Byron Jorns, is dedicated in his honor. The CALS History Workgroup, Co-Chaired by BSE Professor Emeritus Dr. Ronald Schuler and Genetics Professor Emeritus Dr. Millard Susman, has produced three online historic walking tours of the CALS campus. This series of tours are designed for you to walk around the CALS campus and learn about the history of the college as you go. You can also experience the campus from the comfort of your home!